One of the main problems in playing old cylinders is that they are not always in good shape, literally.They tend to be warped, bent, off-center and in all kinds of shapes except cylindrical. Mr. Lechleitner wanted to get rid of this problem and so he inverted the mandrel and instead uses a grip holding the cylinder by one end, much like on a lathe. The three jaws of the grip are concentric to within 0.1 mm. At the other end the cylinder is held inside an interchangeable ring on an end-gate that folds down to put the cylinder in place. The motor is DC powered, and is placed in the box below the cylinder. It drives the cylinder mount by a belt. The tone arm is a Rabco ST7, advanced by a planetary gear system that can be set to two speeds. The arm can be raised by putting spacing blocks under the drive, in order to play larger size cylinders. The cartridge is an AKG P10. Mr. Lechleitner emphasizes that the cylinder has to be supported at both ends. 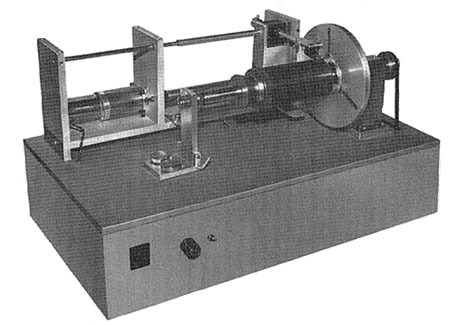 Mr. Lechleitner describes his phonograph in his own words in the IASA Phonographic Journal issue 45 (june 1986), from which the picture on this page comes.